A Different Kind of Wine Club! Discover the CWC difference and get 4 bottles of wine for the price of 2! Use Promo Code JULYWA at The California Wine Club. It's no secret that I'm an easy mark for crisp, textured and gently aromatic Southern Italian whites, an appetizing change of pace in a world full of familiar Chardonnay, Sauvignon Blanc and Pinot Gris/Grigio. Once I got the undersize, very tightly fitted cork out of a tall bottle of Taburno 2009 Falanghina, I was a happy boy. If you've been following these columns for any time, you'll know that Falanghina is a recurring favorite in my tasting reports. An Italian grape variety steeped in history, it dates back at least 2,000 years to the Roman Empire. Although I can't testify to the accuracy of this legend, folks in the region declare that this was the grape used to make Falernum, one of the most highly regarded wines on the Caesars' tables. Could be, although it's worth noting that fanciers of the excellent regional grapes Greco di Tufo and Fiano di Avellino - which are also Southern Italian whites that I consistently admire - make similar claims. I'm not sure what Caesar would have thought, but we were mighty happy with Taburno 2009 Falanghina. With a hearty summer main dish from the garden, it was easy to imagine ourselves on a sunny hillside in the Campania mountains above Naples, looking out over the Mediterranean and enjoying a cool glass of this appealing white. Want more information? Click here for a fact sheet about the Taburno region of Campania from ItalianMade.com. For the importer's fact sheet on Taburno 2009 Falanghina, click here. You'll find my tasting notes and information on finding this wine below. Since 1990, Bruce and Pam Boring, proprietors of The California Wine Club, have been hand-selecting award-winning wines from California's best small "mom & pop" wineries and sharing them with wine enthusiasts. No bulk or private label wines, ever. It's handcrafted quality at an affordable price. * Two bottles of award-winning, limited-production wine. * An in-depth look at the featured winery with Uncorked magazine, including interviews with the winemaking family, recipes and much more! * The Club's 100 percent satisfaction guarantee. Plus, you can reorder your favorite wines for up to 50% off retail! Special Offer: Join now and CWC will include two extra bottles of wine in your first shipment at no extra charge. That's four bottles for the price of two! Just visit http://www.cawineclub.com or call 1-800-777-4443 and use promo codeJULYWA when joining. Give CWC a try! No membership fees and no commitment means that if you're not happy, you're not stuck! FOOD MATCH: Hefty enough to stand up to pork, veal or rich seafood, it was just as fine with a hearty vegetarian main dish, fresh Roma-style green beans from the garden, sautéed with browned onions, garlic and ginger and tossed with scrambled eggs and crumbled tofu. VALUE: It's a good wine and a fair buy in the mid-teens, but it may be worth shopping around if you find it selling for more, as Wine-Searcher.com shows it selling across a surprisingly broad range from $10 to $20. WEB LINK: Here's a fact sheet about Taburno Falanghina on the importer's Website. 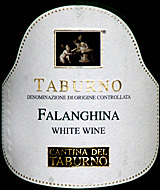 Find vendors and compare prices for Taburno Falanghina on Wine-Searcher.com.